Once again I found myself in Reading, PA looking for a new place to grab some wings. This time while in the west side of town, I decided to try out a place called the Canal Street Pub. From the outside, the building looked humongous and gave the illusion of a grandiose bar with multiple levels. But don’t be fooled, upstairs is actually a Khaki store and the bar resides only on the main level. It is still quite large and has a couple of rooms, though I found myself staying right in the main bar area because of its nice laid back feel. I grabbed a beer, picked up the Pub Menu and ordered up my dinner. I chose to go with the Buffalo style dish or “Hot” as they call it, while my buddy got his with Parmesan Peppercorn. And seeing how he thinks “Battleship” was a great movie, I can’t really rely on his review as being too accurate… especially on a topic I hold dear. I did, however, want to at least include a picture so you can see what to expect. The plates came out looking gorgeous with both celery and carrots accompanying the house-made blue cheese. The carrots were a good size too, not that baby carrot crap you tend to get if you even happen to GET carrots. The chicken was served in a large bowl atop a nice large plate that not only looked fancy pantsy when it got placed in front of me, but also acted as a functioning discard plate when I separated the two. The wings themselves came out piping hot and had a good coating of sauce on them. You could see just by looking at the skin that there was a good amount black pepper and garlic on each one. I hesitated with my first bite when I saw this because too much black pepper can tend to overtake the flavor of a wing and leave a gritty taste in my mouth. But when I started eating, I was relieved to find that I was overreacting for no reason. I could taste the black pepper, but it was not overwhelming, and with the minced garlic, it made this plate a spicy meal. The only problem that I had, besides the fact that this much garlic gives me the “stank post-burps” which can clear a room easily, is that I couldn’t really taste the hot pepper at all. Don’t get me wrong, they were delicious wings and I ate every last bite, but I need to have that classic hot sauce flavor hitting my tongue to feel completely satisfied. 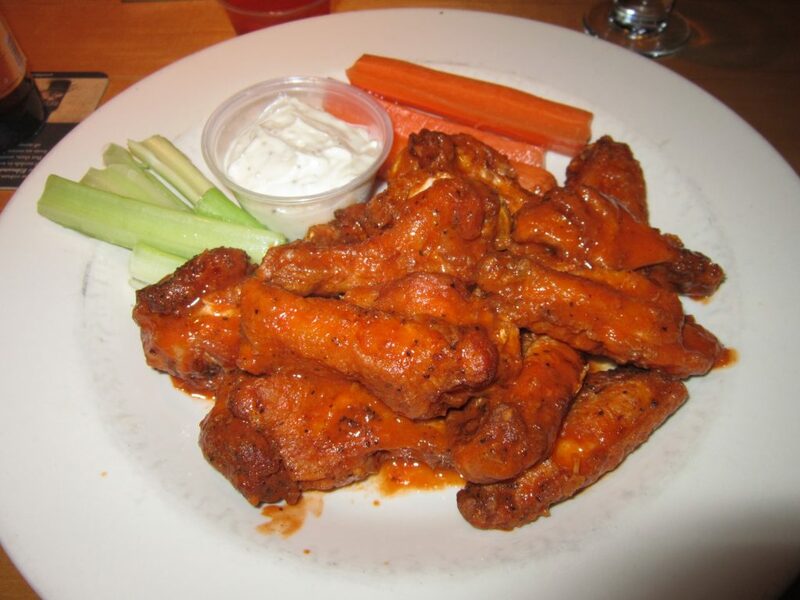 All in all, the Canal Street Pub brought some good wings to the table (or bar in this case). The flavors were nice and even though they weren’t the best wings that I’ve had, they did not disappoint. I was pleased that the black pepper didn’t overtake the meal, but I was left wanting a bit more of that natural Buffalo flavor that I love.